If you love the Jaguar F-PACE as much as I do, but either don’t need quite as large of a vehicle, or don’t quite have the budget, today’s your lucky day. 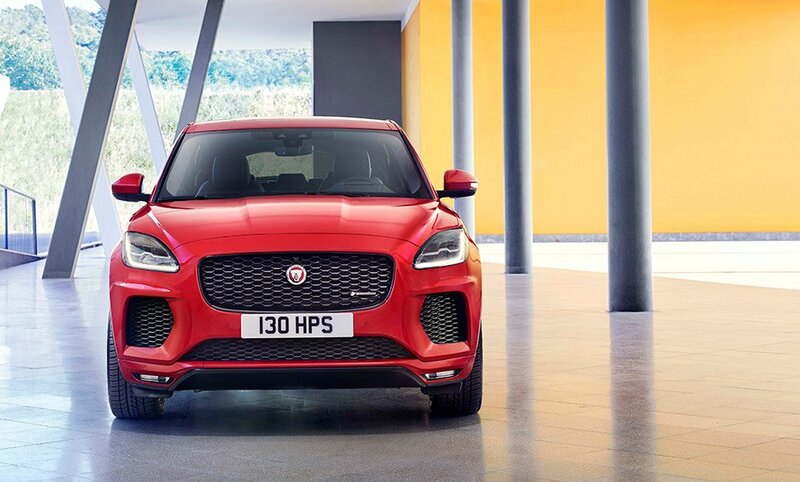 You see, Jaguar just took wraps off of its new E-PACE compact SUV, and it’s basically what would happen if you put the F-PACE into the beam of a shrink ray. 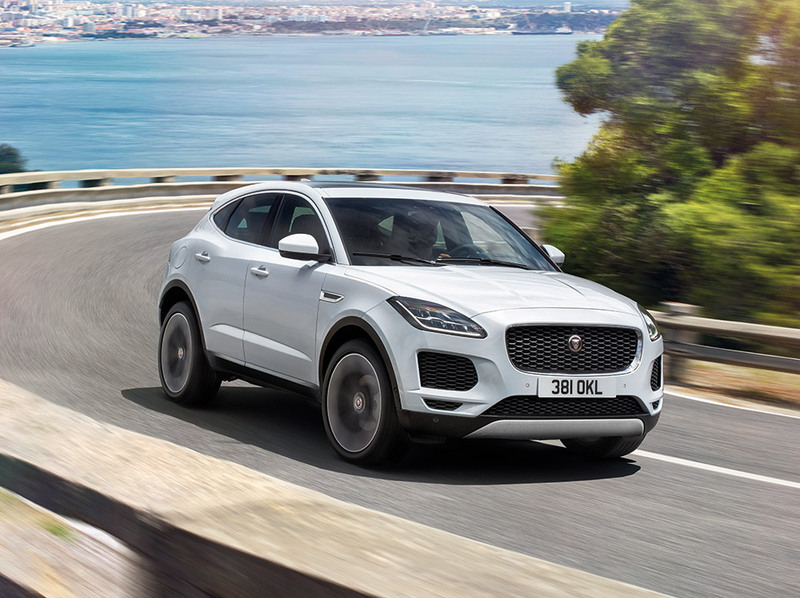 While we don’t have exact measurements yet, it’s clear that the E-PACE is shorter in height and length than the F-PACE, but Jaguar design boss Ian Callum clearly is taking an “if it ain’t broke, don’t fix it” approach to its styling. Other than a slightly more spartan front end, it looks almost identical to its bigger brother. And in my book, that’s an excellent thing. Jaguar literally launched the new E-PACE today by sending a production prototype flying through the air and through a 270-degree barrel roll. Driver Terry Grant had the honors of setting a new Guinness World Record for longest barrel roll in a production vehicle, pulling off an epic 50 foot jump, and pulling up to 5.5g on the way. While you’re unlikely to ever do anything like this in a production E-PACE, it’s certainly a cool way to bring it into the world. So what else do we know about the new E-PACE? Well, here in the States, it will come with either a 246 hp (269 lb-ft. torque) or 296 hp (295 lb-ft. torque) turbocharged, 2.0-liter inline-4 power plant. In its fastest form, it can go from 0-to-60 in just 5.9 seconds, while the entry level engine is no slouch at 6.6 seconds. It also comes standard with all-wheel drive, and a 9-speed ZF automatic transmission. 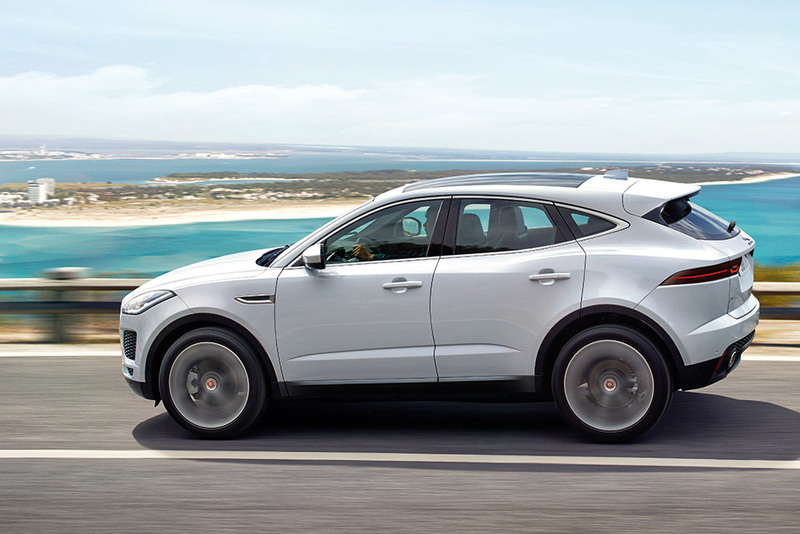 Like the F-PACE and F-TYPE before it, the E-PACE is designed for sporty, dynamic driving. An optional active driveline system is designed so almost all torque can be sent to either the front or rear axles as needed, and can dynamically adjust torque based on driving conditions. The torque vectoring system can apply selective braking to the inside wheels to help keep cornering tight and predictable, improves grip, and reduces understeer. 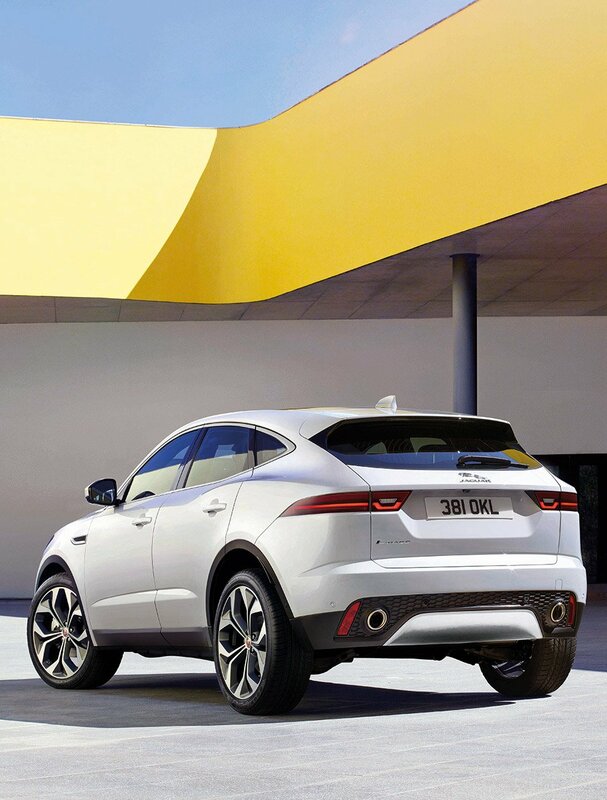 Its stiff, anti-roll suspension architecture is derived from the F-PACE, which offers some of the sportiest SUV handling on the market. That said, I’m hoping for more of the same kind of driving dynamics here. Inside, you’ll find a clean, driver-centric cockpit, and upscale styling touches like premium leather on the steering wheel and shift lever, leather seats with contrast stitching, soft touch surfaces, sand satin chrome trim. 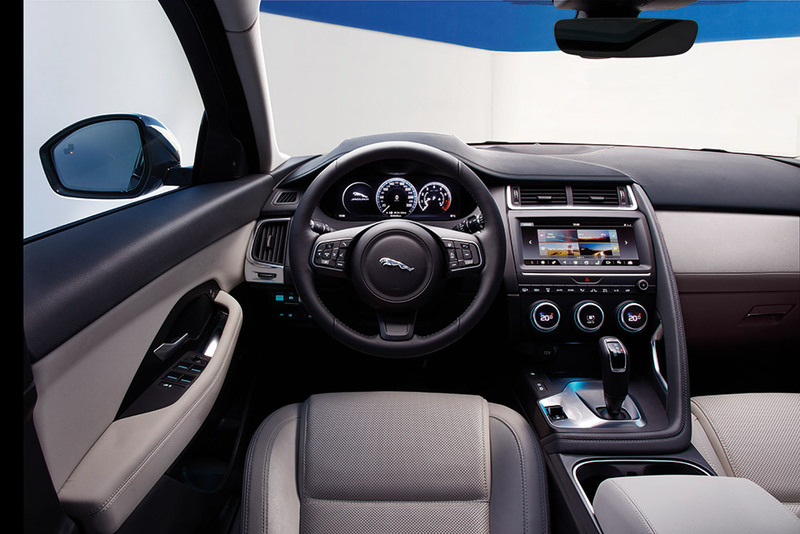 In addition to the standard 10-inch touchscreen infotainment system, Jaguar will also offer a 12.3″ HD interactive driver display and a full color HUD as options. Being an SUV, there’s a reasonable amount of storage space as well, with 24.2 cubic feet behind the rear seat, and 52.5 cubic feet with the back row folded. Pricing for the 2018 E-PACE starts out at $38,600 for the base model with 246 hp, and tops out just north of $53,000 in the 296 hp R-Dynamic HSE. 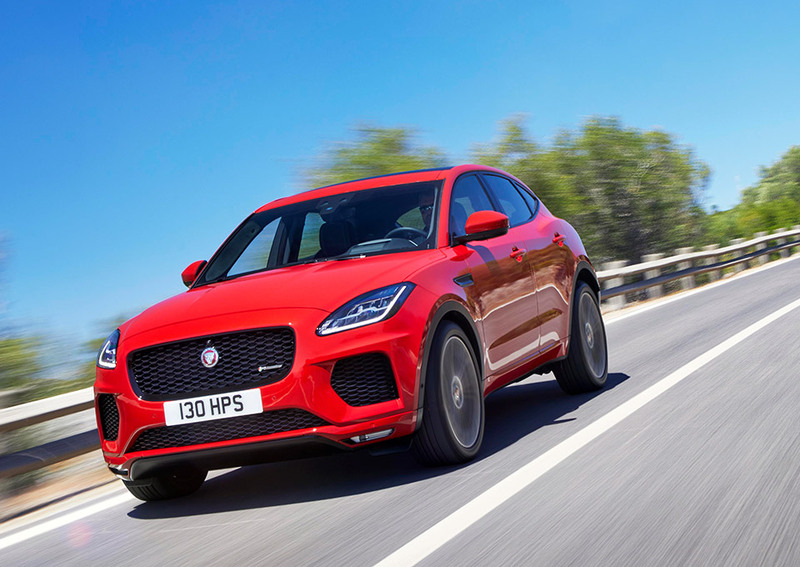 There’s also a similarly-priced E-PACE First Edition, which is primarily focused on upscale finishes like Windsor leather, and fancy Satin Grey alloy wheels, but oddly doesn’t include the more powerful engine. Expect the first E-PACEs to hit US dealerships in early 2018. It’s unclear if it will be sold as a 2018 or 2019 model year vehicle at this point.